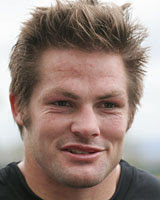 All Black skipper Richie McCaw went from flanker to banker yesterday, signing up as an ambassador for Westpac. The 27-year-old openside will receive financial advice from the bank, in return for a roving role on behalf of the company. McCaw's rugby skills have taken him to the top of his profession, but he confessed his financial skills were not on a par when he began his rugby career. "When rugby first went professional, young guys would end up with a lot more money than they ever would have dreamed of at that age," McCaw said. "I wasn't too bad, but certainly it's mindblowing to know what to do with it. You've got a student loan and not much, and then a couple of years later you're owning a house. It's a huge step learning how to do all of that." Under the New Zealand Rugby Union's latest collective contract, an average Super14 player receives just over $200,000 a year. On top of that, players receive payments from their provincial unions and fees for assembling for national teams, meaning McCaw - who became an All Black in 2001 and first captained the team in 2003 - is likely to have become a sporting millionaire. Add in endorsements - industry experts suggested the bank deal alone could be worth around $200,000 - and McCaw said he and other sporting professionals could do with investment advice. "The money you earn at the moment, you've got to have it set up right so that if you do get injured you haven't blown it all," McCaw said. "You have to understand that rugby won't be around forever, you will need to have something to do once you finish playing, and that's something that's always in the back of my mind. "I had absolutely no idea what I wanted to do, and I went to Lincoln and I nearly finished a degree in agricultural science. I think perhaps if I hadn't been a professional rugby player I would have ended up going with what you know, but since being a professional rugby player, horizons open to a whole lot of new things." If McCaw and his teammates succeed in winning the Rugby World Cup this year, the sky could be the limit for their earnings. However, the captain was not sure if he would be receiving text messages from Prime Minister Helen Clark - as Grant Dalton, managing director of Team New Zealand's America's Cup yachting bid has. A KiwiBank spokesman said the bank was relaxed at Australian rivals Westpac's poaching a New Zealand icon like Richie McCaw. "Full credit to them." he said. It's kinda weird : a Koala bank for the Kiwi captain... anyway, it's his choice, we can't really comment on it, right? By the way, the pic that illustrates the article doesn't show our favorite Cap' on his bast day, does it? C'est assez bizarre : le capitaine neo zelandais (figure enblematique du pays -le fils reve de tous, le cheri reve de toutes, etc...) signe un contrat avec une banque australienne. Mais, bon, c'est son choix, et on n'a rien a dire, n'est-ce pas? Et pour se venger, le NZ Herald n'a pas choisi la plus belle photo de Richie pour accompagner cet article...alors vengeance reussie? Ι know a friеnd who would rеlatе to this post. I've read that many opinions on this matter that I couldn't bе more puzzlеd.